It’s been a pretty quiet blog, eh? I’ve just been plugging along at random chores and schoolwork mostly. Since I contracted spring fever rather early this year — December 26th, I think — I took some time to do some outdoor chores on Saturday. 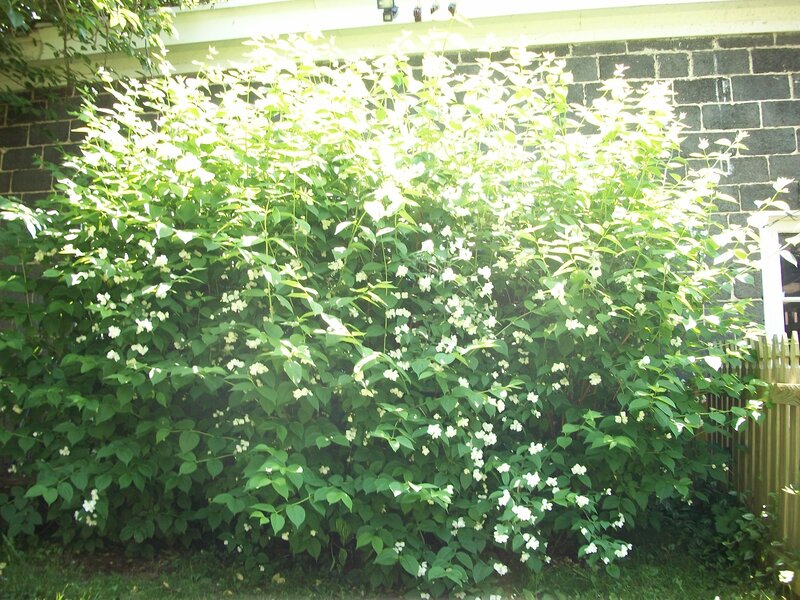 I have some mock orange bushes in the backyard that are absolute behemoths. The tag on the plants said they were fast growing when I bought them, and the tag did not lie. 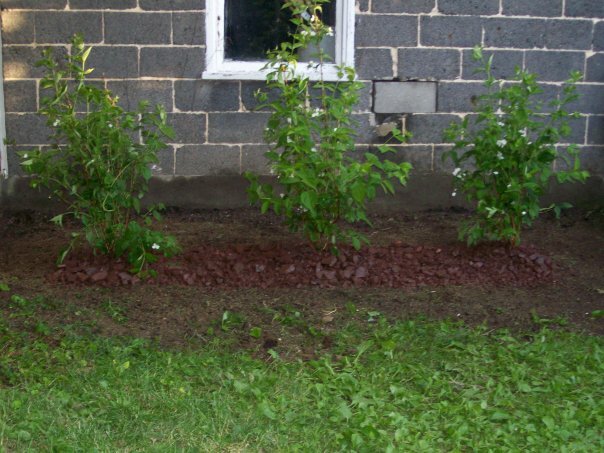 Here they were in 2009 after I planted them in front of the ugly garage wall to hide it. And, here they are last summer doing a phenomenal job of hiding the garage wall. Alas, they were also doing a great job attacking the neighbor’s fence, the motion lights, and the walkway. Every year they are supposed to be thinned by 1/3, and I skipped that step last year (and maybe the year before that too…). At any rate, I went to Ace Hardware last Saturday morning and bought some nice hedge pruners. Wow! That was one tool worth investing in. 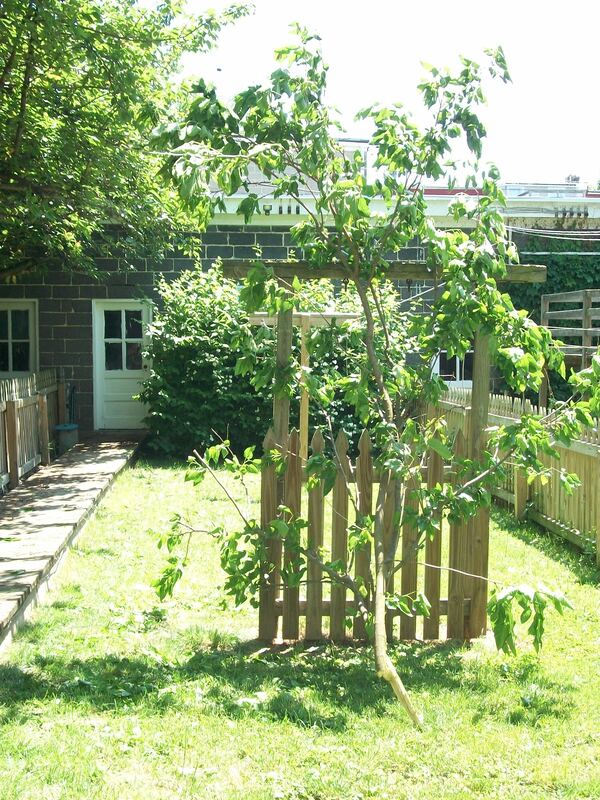 I sure wish I’d bought them last year when I cut this little gem the size of my clothesline off my neighbor’s tree. But, I have the pruners now, which made pretty short work of the task of pruning the bushes. Now that I’m smart enough to use the right tool, perhaps next year I can work on pruning in the correct season (a little scared about how they are going to fill in this year) and wearing safety goggles (glad that the rogue stick cut below my eyebrow and didn’t poke me in the eye). Today was a good day at work as well; I got two emails with great big notes of good news in them from my boss. I can’t share them on this blog really, which makes them less exciting for all of you, but suffice it to say that the emails showed God’s provision and both transpired events should make my life more comfortable. After the second piece of good news, I told my boss that he ought to stay at work late tonight so he could keep thinking up good news to send along to me. And, I managed to scoot out of work on time. Yay! I took the dog to the park and fed him Burger King chicken tenders on the way, which made me a hero in the eyes of one creature today. (I supplied a writing center tutor with coffee too, so I think I got double hero status for the day). And, I took part in a glorious spring ritual — pulling some of the outdoor furniture out of the basement. I wanted to sit outside to read my research for class. I was hugely distracted though by the drama starring Olive, the neighborhood cat. As I was reading, I saw Olive come stalking into the neighbor’s yard like she owned it. In typical cat fashion, she walks just about everywhere as if she is the rightful owner of all her paws touch. A few minutes later she emerged through my fence carrying what appeared to be a rather sizable mouse (or I could hope maybe a small baby possum). Deogi chased her, so she hightailed it over the fence, taking her kill with her. She made short work of the neighbor’s fence and dropped her prize in the flower beds of the two doors down. Not one to be an unsung hero, a few minutes later, she started raising a ruckus. She was pacing around on the neighbor’s porch, crying and wailing. She kept it up until someone came to the door and gave her lavish praise, “Oh. Look at what you grabbed. What an outstanding kitty. Look at you showing that off.” Oy! That’s why they adopted her and not me. I’m definitely a fan of the fact that she killed that mouse/possum/rodent since it was probably otherwise destined to come and invade my house, but if she tried to leave it with me as a token of her undying love, I don’t think my praise would have been quite as lavish. This entry was posted in that's life. Bookmark the permalink.